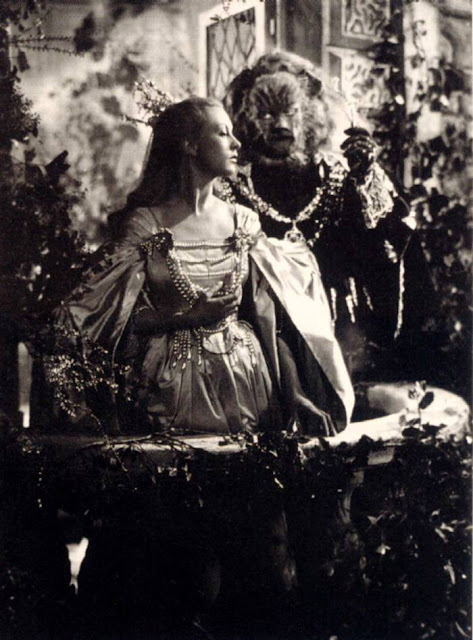 Beauty and the Beast, the first film of Cocteau’s own since The Blood of a Poet, is by general consent one of the most enchanting pictures ever made, and its production was one of those undertakings that with a kind of general benevolence shed luster on all its participants. It brought new accolades to Madame Leprince de Beaumont, the eighteenth-century author of the fairy tale. Jean Marais suggested the film: For him, his face masked by the fur and fangs of the Beast, his body padded and swathed in velvet, his hands made into claws, it was a triumph of acting over physique. Lovely Josette Day plays Beauty, the good country girl, with an intelligence and a dancer’s grace that Cocteau praised without reserve. She, the actresses who play her wicked sisters, and the rest of the cast are outstanding in the way they speak, move, wear their clothes, and form tableaux à la Vermeer and Le Nain. The Gustave Doré sumptuousness of Christian Bérard’s costumes and decor is reminiscent not in style, but in spirit and success, of Bakst’s lavishness in ballet. In Bérard, Cocteau had found a new fellow master of fantasy, an anti-modern, neo-baroque successor to the Picasso of Parade; and the high style of his famous perspective of human arms emerging from draperies to grasp lighted candelabra that materialize in the air, the moving eyes of his dusky, smoke-breathing caryatids, his pair of Louis XIV marble busts of Turks, lend fantastic cinema a nobility that had been previously hinted at—one can only mention the earlier film again—in The Blood of the Poet. Henri Alekan gave the photography the tone Cocteau wanted, the “soft gleam of hand-polished old silver,” particularly exquisite in the swaying, sheer white curtains, in Beauty’s tear that turns into a pearl. The most haunting feature is Marais’ beast mask, a remarkable creation, so appealingly beastlike as to be more “becoming” than his lover’s-postcard transfiguration as Prince Charming at the end of the film. The idea of the film was hard to sell to a producer, and although it became a professional and commercial undertaking, with well-paid stars, jealous unions, watchful insurance companies and budgeted financing by Gaumont, Beauty and the Beast nevertheless represented a triumph over primary difficulties. Like most of the combatant countries, France emerged from the war stripped; Cocteau himself was receiving food packages from Jean-Pierre Aumont in California, and when he fell ill he was treated with American penicillin; everything was in short supply. Old cameras jammed, old lenses developed flaws, no two batches of film were alike, electric current failed or was bureaucratically cut off; there was small choice of fabrics for costumes, sheets without patches were sought everywhere for the farmyard laundry scene, the curtains of Beauty’s bed were stolen from the set. 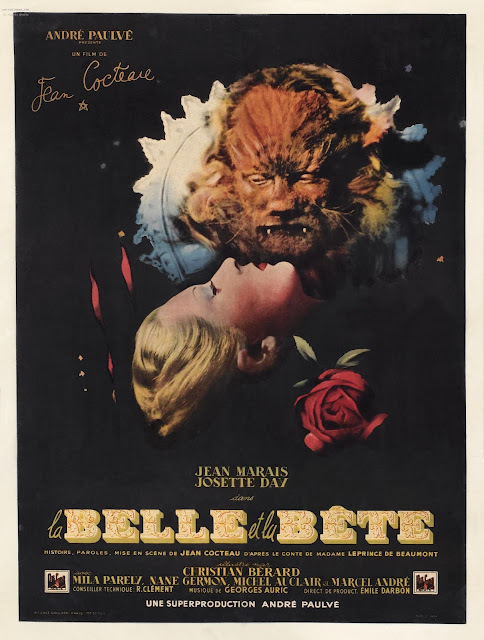 The filming of Beauty and the Beast brought Cocteau an enchantment reminiscent of his days with the Diaghilev troupe, the sensation of being part of a hard-working family of sacred monsters; moving from manor to château to Paris film studio they were like mountebanks. Cocteau’s journal celebrates the camaraderie and good will of the company—the actors’ professional tolerance of each other’s crises de nerfs, their busy shuttling between the film studio and the legitimate theaters where some of them were simultaneously appearing in plays, the combination of familiarity and respect shown by the grips, their never failing improvisation when rescue was needed, the studio sweepers’ praise after the first rushes, the Vouvray wine with the picnic meals, cast and crew playing cards during rests.